Take this Mexican favourite out of the kitchen and onto the campfire for a rustic twist with all of the cheesy goodness you expect from a quesadilla. 1. Special equipment: a hot campfire with a grill grate or an oven preheated to 375ºF. 2. Add the butter to a skillet with the mushrooms, onions, bell peppers and some salt and pepper and cook, stirring, until caramelized, 15 to 20 minutes. 3. To build the quesadillas, spread one side of the tortillas with a little softened butter and place buttered-side down on individual heavy-duty foil squares. Top with a mixture of the Cheddar, Monterey Jack and goat cheese, sprinkle on a few jalapenos and then add some of the sauteed vegetables. Fold in half and seal into individual foil parcels. Cook on a hot campfire grill until warmed through and the cheese is melted, 3 to 5 minutes. 1. To build the quesadillas, spread one side the tortillas with a little softened butter and place buttered-side down on individual heavy-duty foil squares. Top with a mixture of the Cheddar and Monterey Jack. Fold in half and seal into individual foil parcels. Cook on a hot campfire grill until warmed through and the cheese is melted, 3 to 5 minutes. 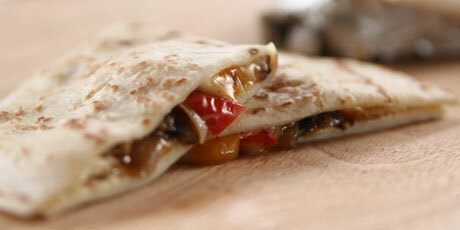 Cook's Note: To cook the quesadillas in the oven, preheat the oven to 375ºF. Put the foil parcels on an oven rack and cook until warmed through and the cheese is melted, about 10 minutes.